Boulangerie Des Rosiers uses sourdoughs (flour and water) exclusively, the same as those that went into the making of breads in times gone by. Enzymes and bacteria act naturally in them. The result is breads that are much more digestible than those containing commercial yeast. In nature, all grains contain some phytic acid. The bacteria in sourdough helps dissolve that acid and, as it were, predigests the grain. They also facilitate the assimilation of minerals from the grains and of other foods ingested. To prevent intestinal flora from working too hard, it’s also important to have a bread with the PH of the sourdough culture as close as possible to the PH of pure water, which is 7. The average pH of our breads is 6.5, so as to be in harmony with the PH of your intestinal flora. Over the last 50 years, wheats have been pollinated and crossbred to increase gluten strength and to optimize grain productivity. That phenomenon has brought with it a significant wave of gluten intolerance. 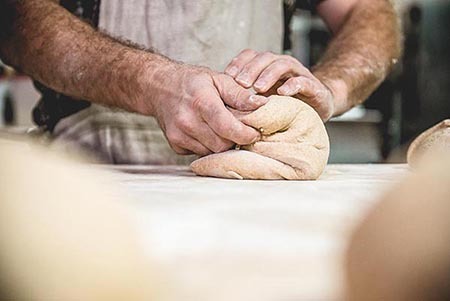 At Boulangerie Des Rosiers, we use 100% sourdoughs that have the ability to break down gliadin, the gluten protein, responsible for most wheat intolerance. 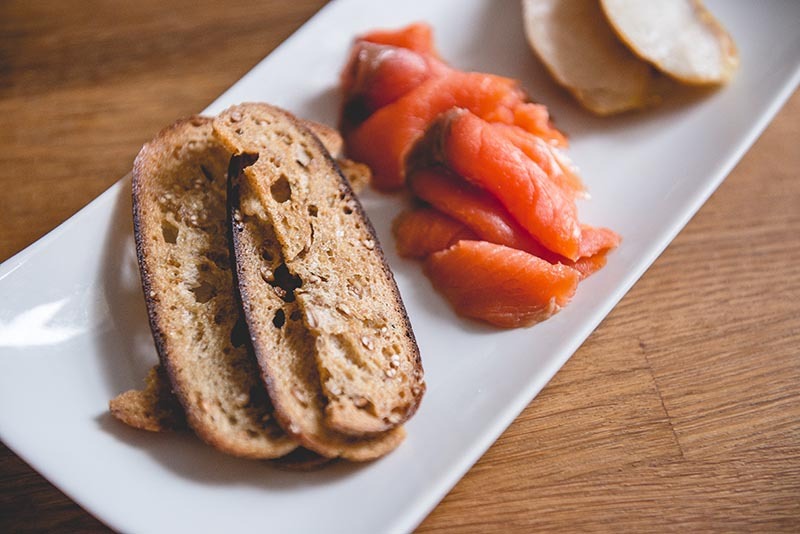 All our breads undergo a long fermentation of 12 to 18 hours, allowing for maximum exploitation of flavor enzymes. Slow fermentation in cooler temperatures enables the bread to take on more pronounced flavors, on the same principle as a marinade for meat. 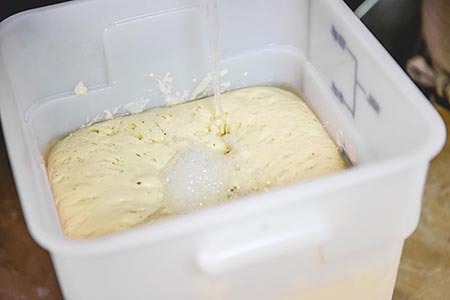 Slow fermentation also allows for control of the acidity in the sourdough in order to break down the gluten, thereby making the bread more digestible. We fold our dough manually at fixed intervals for several hours. 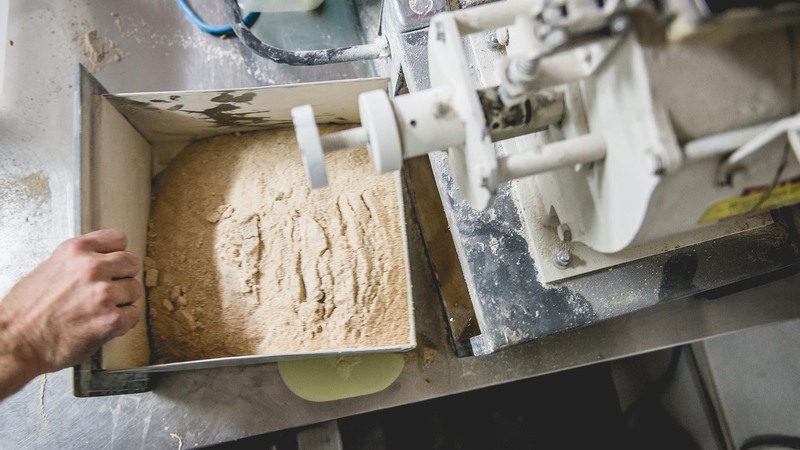 This slow process allows us to do a delicate kneading and to maintain better control over the breakdown of the gluten. In addition, the fact of allowing the dough to rest leaves it enough time to fully develop its flavor. The use of a commercial kneading machine makes it possible to knead a dough in six to eight minutes. For us it’s unthinkable; the mechanical force of the machine would tear the dough because the structure of ancient grain is too fragile. Boulangerie Des Rosiers is certified organic by Ecocert Canada. That certification takes into account every ingredient in our recipes. It guarantees the consumer traceability for all the ingredients.